With an estimated 600,000 barns expected to be retrofitted with new lighting systems over the next five to 10 years, together with increasing regulations and pressure on producers’ margins, poultry producers face increasingly complex challenges. Poultry vision is very different to humans not just in colour perception and visual responses but in the mediation of physiological responses to lighting patterns, intensity and composition involving hormonal changes and behaviour. Animal welfare considerations, such as minimum lighting levels at chicken eye height of 20 lux, have been built into the design of Greengage’s Agricultural Lighting Induction System (ALIS), ensuring it complies with the latest health and environmental regulations. Based at the Roslin Innovation Centre, University of Edinburgh (famous for Dolly the Sheep) at the heart of the European centre of excellence for animal science, Greengage is ideally placed to provide technology-led solutions. ALIS is the only lighting system independently verified on farm (under the ETV scheme by the National Physics Laboratory) for suitability with the domestic fowl photopic response. 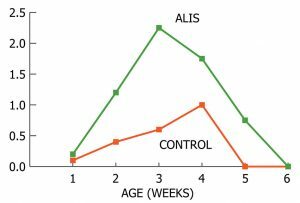 Results show ALIS is 33% more effective for the photopic response in poultry than traditional lights. ALIS LED lamps clip-on to a unique proprietary induction power cable – making installation and maintenance simple. A controller precisely delivers ‘dawn to dusk’ conditions inside sheds. Anecdotal data from commercial trials and field intelligence indicates that ALIS creates better light distribution, calmer flocks, less wet litter; while helping to reduce mortality rates, floor eggs and producing better feed conversion ratios. A comparison of ALIS with a commercial 20w Compact Fluorescent Lamp (CFL) system by SRUC (Scotland’s Rural College) demonstrated key benefits from ALIS. In two out of three trials there were apparent improvements in European Production Efficiency Factor (EPEF) resulting in an average increase of gross margin per net kilogram of 0.91 pence. Perching behaviour may be affected by leg and foot lesions and associated changes in locomotor ability thus, hock and footpad lesions may impact on perching, mobility and health. From week one to five, birds in the ALIS system performed significantly more perching compared to the CFL (Control) system. Comparison between the two lighting treatments for mean (±SE) percentage of birds performing perching behaviours at week level. ALIS typically costs £5,000 to £6,000 per shed with customers benefitting from estimated energy savings of 40% on like-for-like lumen output (compared with compact fluorescent). Greengage offers an ETV certificate authenticating a LED warranty lifespan of over 80,000 hours compared to other products averaging 40,000 hours. 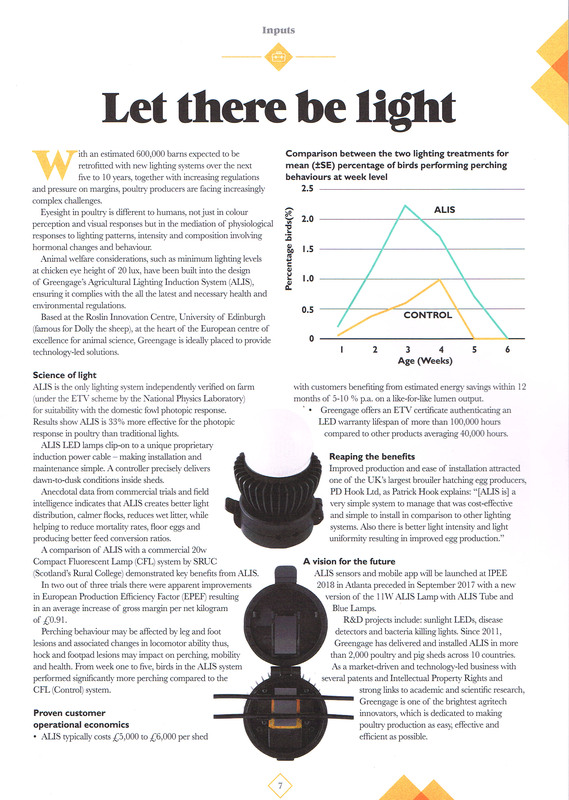 To find out more about the benefits of the ALIS lighting system and how it can reduce energy and feed consumption, submit your details below, and a member of the Greengage team will contact you to arrange a brief presentation.